Herpetology is the study of reptiles and amphibians. The act of searching for reptiles and amphibians is referred to as ‘herping’. In the process of searching for these creatures, a photographer or an enthusiast may face several moral and ethical dilemmas. Before undertaking nature photography, one must understand the importance of conserving and protecting the welfare of the animals that are being photographed and that no harm comes to them. Nature photos are best used when in aid of conservation efforts, not in the pursuit of personal glory. 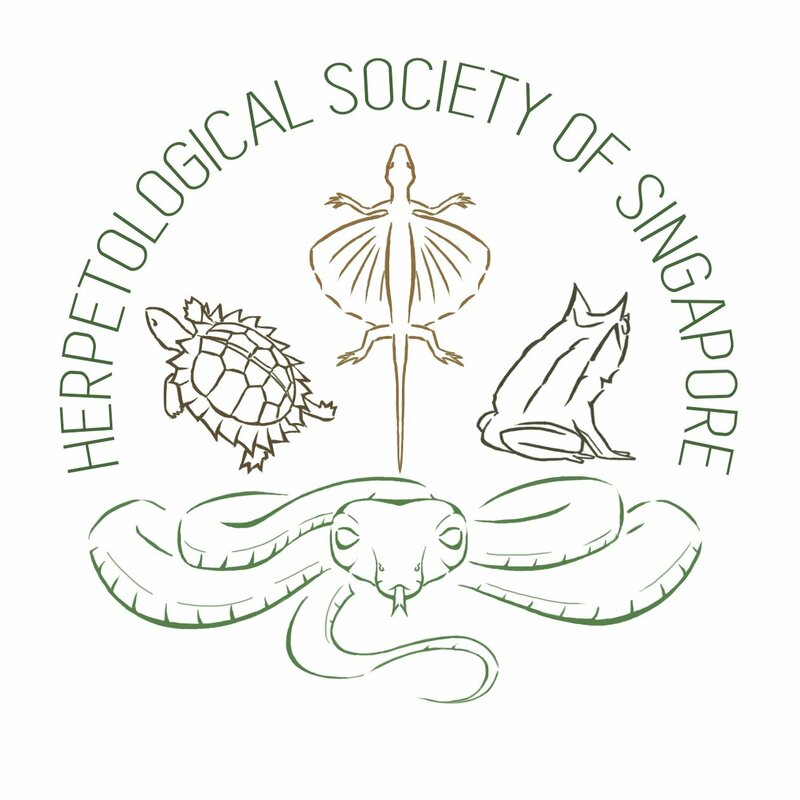 The aim of this write-up is to consolidate a set of rules for herpers and nature photographers (concentrating on reptiles and amphibians) to abide by whilst out in the field. By following these guidelines, a herper or nature photographer will be able to document these creatures in a scientifically viable method. Furthermore, these guidelines allow them to do so in a manner which is safe for both the subject and the photographer. 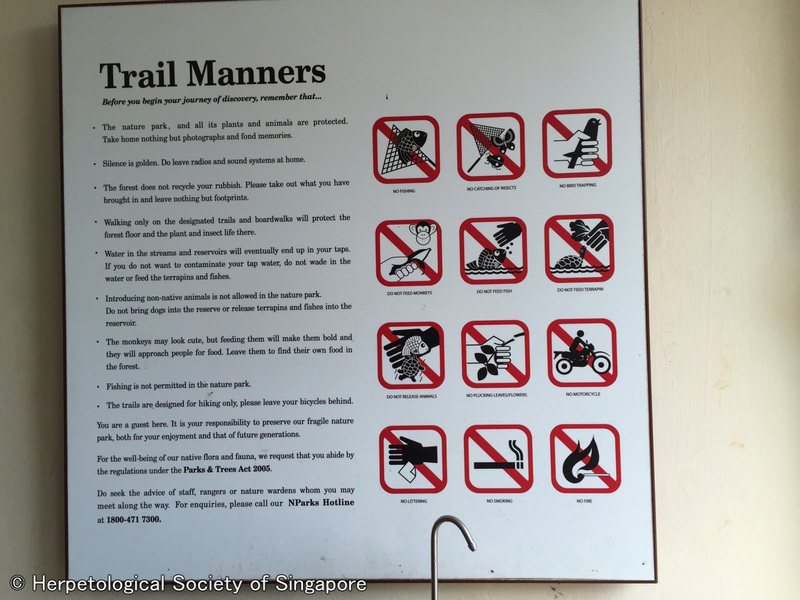 While the code for nature photography may be different in other countries, the reader is asked to keep in mind that these guidelines apply within Singapore, taking into consideration our limited nature spaces and relatively smaller populations of animals. This essay was adapted from Mr Nicky Bay’s Macro ethics page. Do check it out at this link. Safety. You do not want to harm yourself or the animals in the process of photography. At the end of the day, safety of both is your responsibility. Take adequate measures to ensure that no harm befalls either party. If you feel uncomfortable or unconfident in doing something, don’t do it. As a rule, never herp alone and ensure you have each others’ emergency contact details. Carrying a simple first aid kit is also advisable. Responsible usage of the photo. Even after the photo has been taken, it can have a large impact. If the animal that was taken is threatened and is known to be a target of poaching, avoid releasing these photos to the publicunless explicit permission is given for special usage (e.g. conservation projects). They might end up alerting poachers to the location of the animal. Respect for the animal. Do not indignify the animal by irritating it to elicit a reaction. Trophy shots and handling shots are disrespectful and distressing to the animal. Generally speaking, it is unnecessary to handle the animals as it unduly stresses them out. Before handling any animal, ask yourself, “Why should I handle it?” As a rule, amateurs should not handle any animals that they encounter. Refrain from disturbing ANY animal that is in the midst of consuming a meal. It should be documented, however, with as much discretion as possible via photographs and videos as these are important observations of animal behaviour. Often, when a subject is engaging in such processes, do not attempt to handle them. This may be extremely dangerous both for the handler and for the subject. (e.g. Snakes are extremely irritable before they shed their skin and are more likely to bite.) Try to document these processes from a safe distance (will not cause a disturbance to the animal). It requires many years of training to safely handle a venomous snake/large constrictor. Therefore, it is highly inadvisable to handle such animals without the proper training. It also requires experience to correctly identify a snake. Additionally many snakes have evolved mimicry, which makes it difficult to tell different species of snakes apart. It is strongly not advised to handle the snake without identifying it properly. Extreme care and caution must be taken to ensure a lizard’s tail does not break (automising). The tail of the lizard is extremely important to it as it stores most of its energy reserves there. It is highly recommended that one does not try to handle a monitor lizard (Varanus sp.) as they have extremely sharp claws and teeth. It requires specialised training to be able to handle them without incident. Most turtles and terrapins will expel the contents of their cloaca as a defense strategy. Doing this will cause undue stress to the animal; therefore it is not recommended to handle chelonians. However if it is necessary to handle one (in the case of identification), one should always grasp the turtle firmly with four fingers at the plastron and the thumbs on the carapace; also take note that a terrapin can inflict a painful bite. Sea turtles are very endangered animals which are also very sensitive to handling. By no means handle sea turtles. If you encounter a sea turtle laying eggs or hatchlings returning to the sea, observe them from a safe, respectful distance. Do not handle amphibians with bare hands. Most amphibians have extremely delicate and easily damaged skin which is vital for their respiration. Improper handling can result in skin damage, which can lead to further complications for the subject. Furthermore, several amphibians secrete toxins from their skin, which can sometimes elicit an allergic reaction in the handler. It goes without saying that crocodiles can pose a danger. When encountering a crocodile, simply observe from a safe distance. Do take photos, but do not get too close to it. If it is on the trail, do not attempt to bypass the crocodile. If the subject was found under a rock, it is imperative to place the rock carefully back in the same position as it was originally. If the subject is in a location that poses a risk to its own well being or to the safety of others (e.g. in the middle of a road, in someone’s house), it can be moved a short distance away to a safer location. If the subject is handled for record taking purposes (e.g. measurements, sexing) do return the animals/animal to the exact location that you found it in. Subjects should never be collected without an official permit from NParks. Collection of live specimens without a permit is considered poaching, which is a chargeable offence. Dead animals may be collected to be deposited at the Lee Kong Chian Natural History Museum for scientific records. Do take a shot of the ‘crime scene’ for record purposes. Spraying water to create artificial rain – unnatural rain means the subjects may not know how to escape from it, this may also cause the subject to be cooled, thus slowing down their metabolic processes. Artificially placing 2 or more subjects together, this may cause undue stress on most reptiles as they are not socially communal; additionally some snakes are ophiophagous (consume other snakes, even those of the same species). Therefore placing two subjects together is not recommended. Baiting subjects by placing food in the open to attract them. The bait may introduce disease and parasites to the subject. Refrigerating subjects so that they are slowed down or incapable of movement. This is highly unethical, especially for reptiles and amphibians as they are poikilotherms (unable to create their own body heat). Gluing or restraining subjects in place to stop them from moving. This is unacceptable and cruel, regardless of the type of animal. Before deciding to share such “art” on social media in the future, consider what went on behind the scenes. Nature photography is about bringing the beauty of nature to the viewer. Staged photography is possible without adopting the use of unethical practices as stated above. However, it is much better to shoot subjects in situ as they provide much more valuable scientific information when presented in their natural state. Learn to appreciate every life form with equal importance. A commonly seen frog/lizard/snake has an ecological role of equal importance to that of a “rare” herp; treat all forms of life (including non-herps) with the same amount of respect you give people. Recognize when a subject is stressed out and when it is time for you to move away to avoid further stressing it out. When herping in groups, minimize the amount of disturbance you cause for the animals and give way to other photographers. Don’t clamor for shots. This will ensure smooth, sustainable photography. Refrain from cutting/plucking any leaves. A solitary leaf could be the essential cover for an insect against predators. Cutting leaves to unblock the photograph can result in the death of the organisms that they shelter. As obvious as it sounds, take nothing but photographs, leave nothing but footprints, kill nothing but time. Always keep a spare plastic bag in your backpack to store any litter you may generate during your field trip. Before posting photos of the rare subject that you have just shot, consider the potential impact on the creature’s habitat. Poachers may get excited on seeing your photos and hunt for the subject. If you do put pictures of uncommon animals on social media, be sure to remove EXIF data from the photo. EXIF data contains GPS information as well as other information about the location and time. This data is easy for a poacher to access and exploit. One way to minimize this is to disable GPS tracking on the camera being used. Alternatively, remove such sensitive data in post-processing. When someone else is shooting, do not obstruct their view and do not stand behind the subject as you may become the photo’s background. When others are shooting subjects under the water, such as a stream or shore during low tide, never stand upstream. Doing so will kick up murky water to where the subjects are. This may have a detrimental effect on aquatic species such as frogs and fish. Noise and sudden movement can scare away skittish herps especially frogs and lizards. Watch where you step and be quiet when others are shooting. If you find yourself embarrassed or uncomfortable when questioned about something you are doing, you probably should not do it. Of course, this does not mean that you can do whatever you want if you have a thick hide. Trophy shots and selfies with subjects are disrespectful to the animals. Avoid doing this and discourage members of public from doing so as well. If you spot others engaging in any unethical acts stated above, be tactful in informing them. You can also educate them on why the act is unethical and how they should behave. If they are not compliant, report them to the relevant authorities. Do NOT attempt to take the law into your own hands. This only serves to aggravate them and make the situation worse. For offences within the parks and nature reserves, call the NParks hotline at 1800-471-7300. For poaching incidents, contact the police immediately. It is also advisable to tactfully document unethical behaviour with your camera to aid in any subsequent investigations. Sharing of photos online is commonplace. These are scenarios that one would face sooner or later, either as a photographer, website owner or internet user. Do not wholly trust what you see on the internet. Even some reputable sources can have errors, always cross refer a few different sources or ask an expert on the subject. If you publish an ID, copy a description or derive any text from another person, website or book, please include the ID credit. Proper identification can sometimes be complicated work, so credits should be due. ID credits also allows others to follow up with discussions with the correct person who made the identification. Avoid stating the full species of any subject unless you are absolutely certain or have consulted an expert who is certain. Identification is based on a specific set of characters and NOT simply based on visual similarities on photographs. Subjects that appear “identical” in photos to an untrained eye should not be assumed to be the same species. Conversely, subjects that look radically different can actually be different morphs of the same species. Most scientists will refuse to identify based on a photo because they sometimes need to examine the specimen under a microscope to accurately determine the defining characters. Upload a copy of the image to your own website/page without explicit written permission from the owner. Resize, crop or manipulate the original image in any way not explicitly permitted by the owner. Remove or replace any existing watermarks. Handling of watermarks should only be done by the copyright owner. Do a reverse image search to find other sites hosting the image. READ the content of the sites to find out if they specified the owner of the image, and look for the photographer’s contact. The photographer put in a lot of effort and money to produce the image. You could easily spare a few minutes to do this. “No time” and ignorance is not an excuse. NEVER credit “Google Images”, image aggregators, nor any news agency. They are definitely not the owners of the images. If in doubt, do not use the image. Misusing images without permission can result in a lot of trouble. The board above is an excellent summary of the rules when it comes to visiting any green space in Singapore. All parks under NParks will have these boards posted at the entrance listing what you can and cannot do. Do abide by these rules. You’ll have a great time! We would like to thank Mr Nicky Bay of Macro Photography in Singapore for allowing us to adapt his page on ethical macro photography. We would also like to thank all the people who gave us advice on what we should include in this page. Ethical herping is something close to our hearts, so your advice meant a lot to us!